Appointed 19 December 2007, ordained 24 February 2008, at Aliwal North. PO Box 73, De Aar 7000. Residence: 1 Van Riebeeck Street. Rt Rev. Joseph De Palma SCJ was consecrated first Bishop of De Aar on 19 July 1967. Died February 2, 2005. Rt Rev. Frederick Lobinger was Apostolic Administrator from 13 March 1988 to 30 April 1992. Rt Rev. Joseph Potocnak SCJ, appointed Bishop of De Aar on February 12, 1992, ordained Bishop May 1, 1992 and retired 23 September 2009. 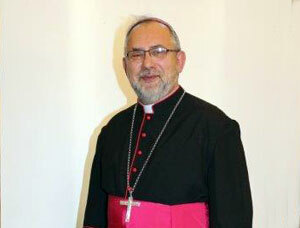 Rt Rev Adam Musialek SCJ appointed Bishop of De Aar on 17 July 2009 and ordained Bishop on 24 September 2009. On 24 March 1953, this Territory (formerly included in the Aliwal Diocese) was made a Prefecture and entrusted to the American Province of the Priests of the Sacred Heart. The Rt Rev Mgr AJ Dettmer SCJ was appointed the first Prefect Apostolic. By decree of the Holy See, dated 13 April 1967, the Prefecture was elevated to the status of a Diocese. The boundaries of the Territory are: Aliwal Diocese to the East, Kimberley Diocese to the North, Keimoes Diocese to the Northwest, Oudtshoorn to the Southwest, and Port Elizabeth to the South. The diocese comprises Britstown, Colesberg, De Aar, Graaff- Reinet, Hanover, Hopetown, Jansenville, Middelburg, Murraysburg, Noupoort, Philipstown and Richmond districts. Area: 67 248 sq. km.